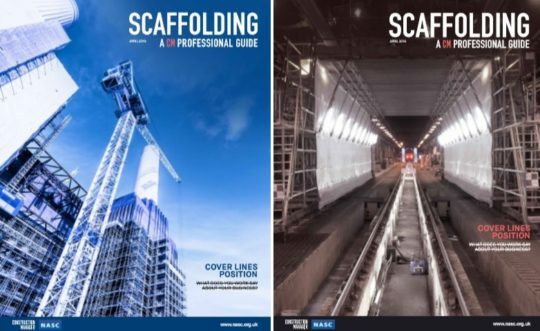 We are delighted to announce that the NASC will publish a new magazine dedicated to Scaffolding. This publication will be created in conjunction with our long-standing media partner, Construction Manager (CM) magazine, and feature NASC member projects, NASC 2018 Award winners, a guide to scaffolding specification and a range of additional high-quality scaffolding-related content delivered by CM’s editorial team. The magazine – to be called ‘Scaffolding: A Construction Manager Professional Guide’ – will be launched with the April issue of Construction Manager. It is intended to complement the NASC Yearbook, published in November each year. Simon Robinson, NASC Marketing Manager, said: “We believe CM readers will welcome a professional guide focusing on the potential use of NASC members’ products and services in all aspects of the construction process as no other publication currently reaches this wide an audience and focuses this clearly on our market. A number of advertising spaces are available to NASC members. For more information and rates, please contact Howard Smith at Atom publishing via email or by calling 07775 670117.